Five weeks that started on July 1. In addition to the usual festivals, it was also an anniversary year: Canada 150 and Montreal 375. Which meant even more festivals and events around the city. Nearly all of the events described below are free events, and very well organized. Montreal Jazz Festival 2017 June 28 through July 7. This is a huge event. Four stages where free live music is played. At Place des Festivals and 2 blocks around it. Great music, great setting, very well organized. Details here. Just for Laughs, outdoor festival July 15 to 30. A great fun festival with lot of interactive areas with board games, human foosball game, ambulatory street performers, and so on. And some good music events too. The final event was a great band, Kool and the Gang, but it was a major letdown since they started 40 minutes after the scheduled start time, wasted time on a opening act band (Jazz Festival organizers would not have allowed this!) and resetting the stage equipment. Messy! Other than this poorly executed “key” event, it was a fun festival. Montreal Completement Cirque, outdoor festival from July 6 to 16. At various spots around Berri-UQAM metro. St-Denis street was filled with participatory games – including trampoline for kids. And various performers – street bands, stilts, shows, on that street. Very cool: two Aquamen from France, heads stuck in water-filled fish bowls with goldfish swimming around, walking on the street. Nuits d’Afrique, outdoor festival from July 18 to 23. This was right next door to Just for Laughs, near Metro St Laurent. Great music, and also new, interesting, good food. Osheaga Block Party at an highway underpass. I like Osheaga music, but have no desire to commit to a full day of hanging out in such densely crowded festivals (and I avoid the island Parc Jean-Drapeau since it can’t really move such crowds well). So this July 22 free block party event was just awesome! The Van-Horne Underpass near Metro Rosemont is actually a pretty large area, with well organized spaces. I saw two groups: 8-10pm DJ Premier & the Badder Band, and 6:45-8pm Killa-Jewel DJing. Jump-up and jump-down music, fun! Two of these were spectacular! Color of Time was a Holi-inspired performance by artists from France. 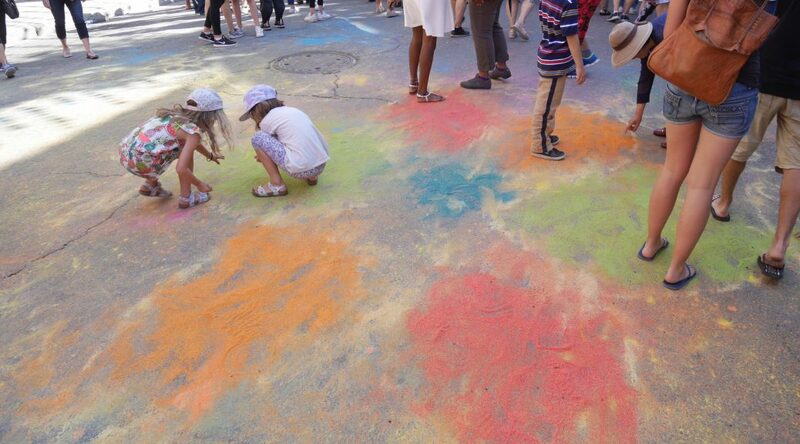 The air and ground on Ste-Catherine St around Berri-UQAM was filled with color powders which also made it to people’s faces and clothes! Place des Anges was an aerial acrobatic show with feathers dropped from the sky and ejected up from the ground! Feathers everywhere video with cool music. The acrobatic portion went on for 45 minutes, then when all the acrobats were on ground, they pumped features from bins in the ground, filling the air with even more feathers. The music was absolutely fantastic, eerie and ethereal, and suited to the event. After that, the DJs started playing, which got everyone dancing while playing with the feathers! My 7×35 Permafocus Binocular was very useful in seeing the details of the aerial acrobats who were 10+ stories high up in the air. Rêveurs Définitifs at St-Denis Theater. Apparitions, levitations, transformations, a mind-blowing magic show. MozART Group show at Place des Arts, Theatre Jean-Duceppe. Four classical musicians playing Mozart (of course), and injecting humor in the music. And then they also played popular music from Abba to Beatles! The Just for Laughs had day-of-show heavily discounted tickets for many of the shows going on during this festival. Montréal Avudo, a spectacular show that pays tribute to the St. Lawrence River. Images and scenes projected on rippling water walls. The larger-than-life projections will come alive primarily on the water. Water jets from 30 or so fountains will create massive 30 X 11.5 meter tall screens of water. The projection screens also include 94 shipping containers, creating the world’s highest container tower at 11 stories tall. Booking free tickets was necessary for this show, sadly they sold-out online very quickly. But they had day of show tickets available starting at 7PM at the venue. This was standing room tickets only, but it was only a 30 minute event, so it was just fine. Formula E Racing in downtown Montreal, Sat & Sun, July 29 & 30. I only watched this for a few minutes, from outside the barriers at Rene Levesque around Rue Cartier. Electric cars Formula 1 racing. Crazy to see cars drive so fast on a city street! They also had a Formula E driver-less Roborace car doing the laps. Photos links has one photo that shows a pissed-off local resident – looks like most Montreal residents were not happy how this event paralyzed key downtown streets and residential neighborhoods for over three weeks. La Balade de la Paix / An Open-Air Museum on Sherbrooke street from the McCord Museum to Museum of Fine Arts. Art works along the street, and flags of the 13 provinces and territories of Canada and the world’s 200-odd countries flying over the street. Cultural Events in Montreal. French-only site, but is good to visit to find all the events going around in the city, organized by the City of Montreal. Another such site created by the city: About Montreal. I was lucky to have stumbled on the À nous Montréal free magazine, which was French only, but I understood the program schedule pages, which was the key! Otherwise, I would have missed all these events. The great thing about these events was they they were held all across the city, so I got to visit parks that I’d never visited in my decades of visits here. Sadly, a bunch of these were cancelled (which I only found out after reaching the park) due to rain or threat of rain. And this summer there were too many such days in Montreal. Two of the best music events: Bluebell Sisters (Blues, Swing, Doowop), Dawn Tyler Watson (Blues). Montreal International Fireworks Festival is on every summer, Saturdays and some Wednesdays at 10PM. Large crowds visit here, even though it is a long walk from the Metro station Papineau and the event only lasts 30 minutes. And isn’t one fireworks show same as the other? No matter, it is still well-attended. Details here. Unrelated, but of note is the Village au Pied-du-Courant which is in this area, a beach area built every summer. Good place for food, music, and watching the Montreal 375th Anniversary Jacques-Cartier bridge lights. La Grande Tournée, 19 boroughs, 19 weekends. One such weekend: August 4th to 6th – Parc Ahuntsic, near Metro Henri-Bourassa. Whole day family events, workshops, food. Great park, just a handful of food trucks, but enough for the small crowds. This place also had a McCord Museum exhibit La ville suspendue with photos and stories of Montreal. Nova Stella, with byline The art of being different together, as part of the Montreal First People’s Festival at Place des Festivals, Saturday Aug 5. Afternoon parade by the 65-troupe-strong Amitié Nuestroamericana. And then music at night – Sonido Pesao was great Latin Urban/Rap! And of course, great food every day. In addition to my standard usual favorites, found two new cool food-items: great pastry Kouign Amann from a bakery near Metro Mont-Royal. And great sausage sandwiches and clam chowders and more at the new Marché public de Longueuil (this requires a car to get to). More info onthe Public Markets. I also tried to learn ice-skating at the Atrium Le 1000 Made 10 visits, 3 of them with falls and one serious face-plant injury (lot of blood, but it all healed in just couple of days, so all good! Hats off to Atrium 1000 employees who quickly bandaged me up). Still can’t ice-skate well, but hey, having fun learning. Weather was pleasant most of the days, though this summer there were more rainy days or thundershowers, more than the normal. Towards early August, it got cool at night (60°F and below) so hot afternoons combined with cool late evenings makes it confusing to dress correctly! And don’t forget sunscreen, especially on face. My face got extra-tanned and I only found that out when I returned home and people told me. So, remember sunscreen every day on all uncovered skin. Sunset is after 8PM, so even if you skip afternoons, you need sunscreen. And since it is not that all events or experiences were good, here are some that were just not worth the time or effort!. In addition to all the events above that I attended, there was no way to attend all the cool events going on at the same time. Some such shows I could not attend: Haïti en folie, July 26-30 at Parc Lafontaine, Montréal. And the Rouge Event – circus at Jardins Gamelin, part of Montreal Completement Cirque. And other events that required full day tickets, which I’d no time for: Comiccon July 7-9, Otakuthon anime convention Aug 4-6, Osheaga music festival Aug 4-6. I also wanted to, but had no time to visit the nearby public swimming pool which looked very uncrowded and very tempting on hot weekday afternoons: Baldwin Pool. Finally, have to give huge credit to the City of Montreal, the STM Metro employees, on how well they handle the huge crowds for these key special events and keep people moving safely. It makes everything just so much nicer and stress-free. There will be extra buses run (#45 going north from Papineau), there will be more STM employees deployed at Berri-UQAM, Place des Arts and other Metro stations making sure crowds are controlled as they swarm the subway. All wonderful.